On June 17, 2018 By gluxboxIn Conventions, General Nintendo, Special Events, Splatoon, Super Smash Bros. This year, my awesome friend Carney and I decided to take a trip to Los Angeles and attend E3 2018! I just got back and while I intend to write a blog about the ENTIRE trip, I wanted to do a quickie overview of E3 first. Game Demos. Obvi. If you can manage to get into a line, playing some of the latest games is one of the best parts of E3. I played Super Smash Bros. for Switch, as well as the new Monster Hunter. However, those were the only demos I managed to play. More on that later. Swag. While not QUITE as impressive an offering as I remembered in 2013, there is still a decent amount of free stuff to get at E3. Tote bags, Vault Boy masks, and free Drakes snack cakes were some of the most prevalent finds at the convention center. Decor. For some reason, the booth setups at E3 are always the coolest. I’ve gone to NYCC, PAX East and PAX West and none of it compares to E3 when it comes to life-size dioramas and game world immersion. Lines. LINES!!! I quickly realized that E3 actually stands for Everything has 3 Hour Lines. Because that’s how it is. We got there at 9am and by the time I was scanned in and at the Nintendo booth at 9:24, the line for Let’s Go Pikachu was 3 hours long. It was very disheartening. The only reason I was able to play the Smash demo was because they forced us to book time slots in advance. But now I’m actually grateful they made me do the extra work because that at least ensured that I got to play SOMETHING. Jeez. Lack of Panels. There were not many ‘events’ planned for E3. Not that it would have mattered, because you’d probably have to commit an entire day to waiting on the line to get in. But one of the best parts of conventions are celebrity panels. Why aren’t there any at E3? 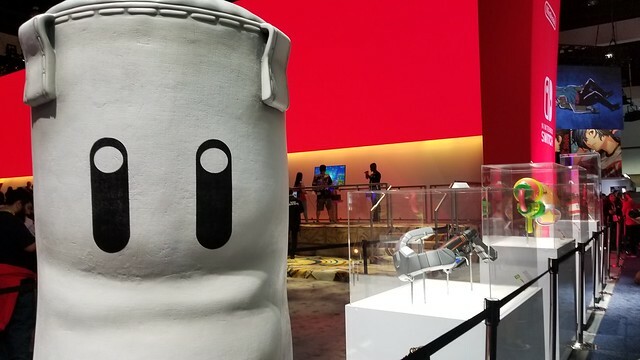 The Cool Nintendo Events Weren’t Actually At E3. The Splatoon 2 Tournament was held at a theater offsite and you had to line up at a specific time on June 11th (BEFORE E3 EVEN STARTS) to get wristbands. Guess what? My flight was only arriving at that time. Same deal with the Smash Bros. Tournament – that day they were giving out tickets at the same time as my Smash Bros. demo time slot. Soooo wait in a line in hopes of getting tickets to watch the Smash Invitational, or actually go to E3 and play the demo I had registered for in advance. Naturally we went with the sure thing. But why was Nintendo forcing us to pick which thing was a priority? It felt very unfair. I caught a few glimpses of the tournaments on live feeds they had on TV screens. Whoop. You Can’t Even Go to the Major Press Conferences. Yeah yeah I don’t have a press pass. But in the game company livestream videos, it always looks like a huge auditorium filled with fans in attendance. In reality, those are all paid professional press badge holders at those events. They are getting PAID to cheer. Actual die-hard fans don’t even get to go to the press conferences. Hmph. Plus they hold the press conferences early in the morning when the rest of us plebs have to wait in lines to get in. We don’t even get to watch unless we wanna burn mobile data. You might sense my disappointment in E3 by now. You would be very correct. I quickly realized that the lines are likely to be much more manageable when I go to the Nintendo NYC store and play in the E3 Demo Area in the convenience of my home state. Honestly, my time spent away from E3 was much more fun. I did lots of cool touristy things and had a blast in LA. I’ll blog about the rest of my trip in a day or two. But for now, check out my Flickr album and enjoy the VISUALS of E3…. at least it’s a very IG-friendly event.